SAN JOSE — Consul General Hiroshi Inomata will present the Consul General Award to five San Jose Japantown leaders for their efforts to better the community and to promote Japanese American cultural ties and awareness. The ceremony will take place on Saturday, Sept. 15, at 3 p.m. at Wesley United Methodist Church, 566 N. 5th St. (between Jackson and Empire), during the annual Aki Matsuri (Fall Festival). 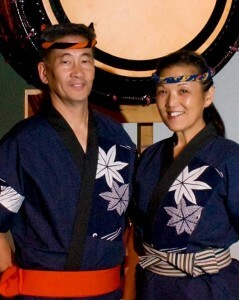 • PJ and Roy Hirabayashi, co-founders of San Jose Taiko, which will celebrate its 40th anniversary next year, and recipients of the NEA National Heritage Fellowship. • Dr. Jerry Hiura, co-founder of Contemporary Asian Theatre Scene (CATS) and board member of the California Arts Council and Arts Council Silicon Valley. • Joyce Iwasaki, senior field representative for Assemblymember Sally Lieber, founder and president of the Ed Iwasaki Memorial Fund, and board member of San Jose Buddhist Church Betsuin, Midori Kai, San Jose Taiko and Japanese American Chamber of Commerce of Silicon Valley. • Joe Yasutake, board member and past president of the Japanese American Museum of San Jose and Japantown Community Congress of San Jose, whose oral history is part of the Densho Digital Archive. At Aki Matsuri, which will be held from 11 a.m. to 4 p.m., people can enjoy food, fun, and festive activities and eating traditional Japanese American foods — inari-zushi and maki-zushi, Spam musubi, chicken teriyaki, barbecue ribs, soba, chicken salad, Aki Dogs, manju, sno cones and strawberry shortcake. The outdoor farmer’s market will be filled with both cut and potted fragrant flowers as well as beautiful houseplants. Also for sale will be many hand-made crafts, Japanese used books, the Wesley Cookbook, home-made jams, Christmas ornaments and “white elephant” items. Visitors will enjoy entertainment by some great local talent, including the church’s own Wesley Jazz Ensemble and Wesley Ukulele Band; Ukulele Jams; Hula by Na Wai Ola; and San Jose Taiko. There will also be games and craft activities for the children, including hair-painting, and a variety of prizes. Admission is free. For more information on Aki Matsuri or Wesley UMC, call (408) 295-0367 or visit www.wesleysj.net.